It’s free if you have an old trash can that you don’t need anymore. Not only is it inexpensive, it takes less than 30 minutes to put together. 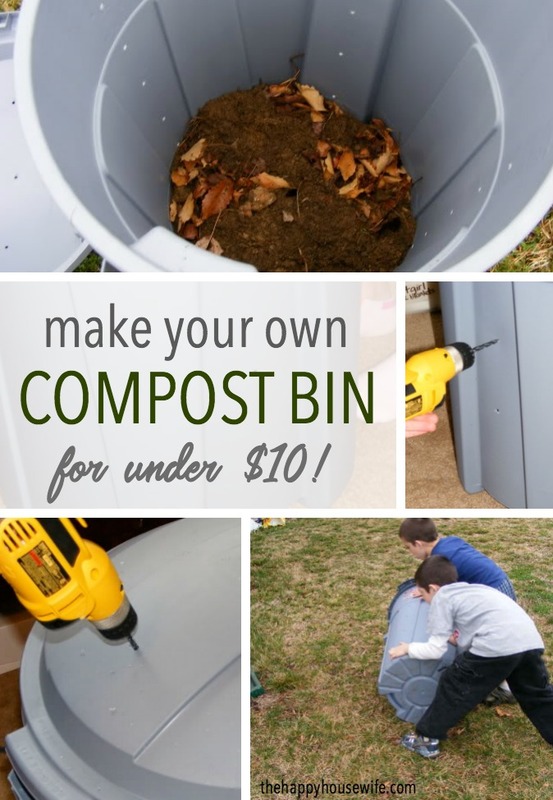 This DIY compost bin was so easy, my kids were able to make it while I was on bedrest with our youngest daughter. I was tired of the amount of food waste we had each week and wanted to compost our kitchen scraps to reduce our waste. Since I was on bed rest, I had to rely on my trusty helpers to accomplish this project. New compost bins are expensive why not make our own? 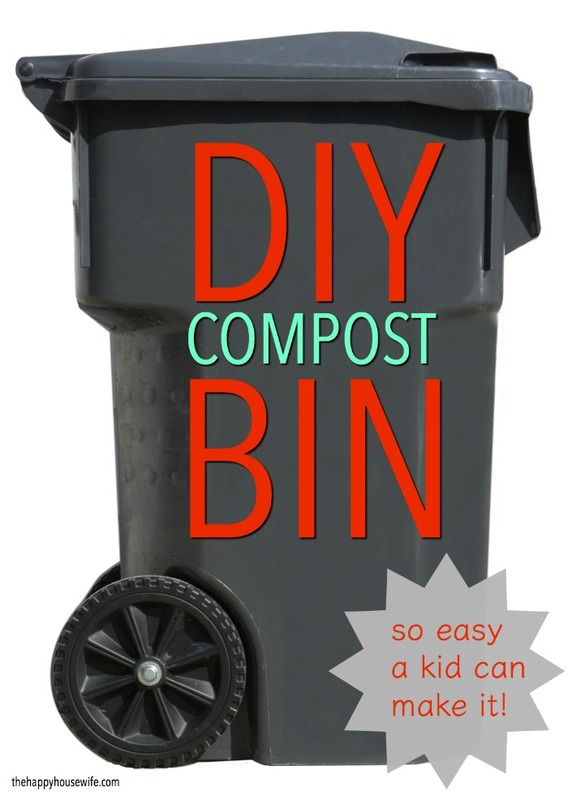 A trash can would be the perfect inexpensive DIY compost bin! It has a lid, you can drill holes in it, and the kids can easily roll it around the yard. Here’s what I used to make our compost bin. 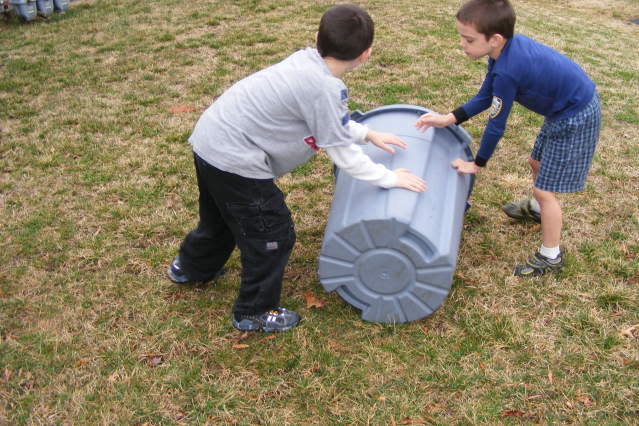 I recommend using a smaller trash can (32 gallon) so that it is easy to roll around your yard once it is filled with compost. 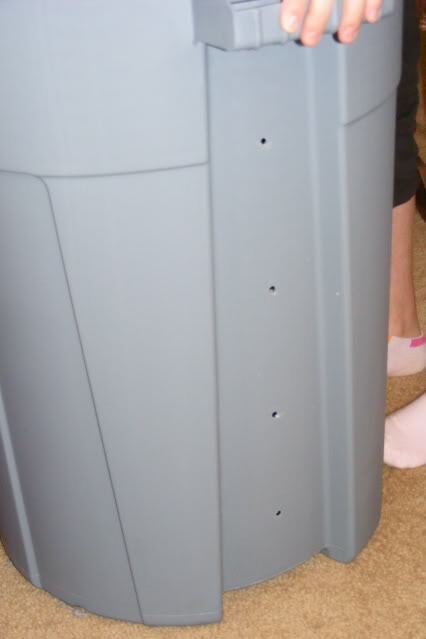 Also, I do not recommend drilling your garbage can inside, unless you have to sit in your bed to take the pictures. 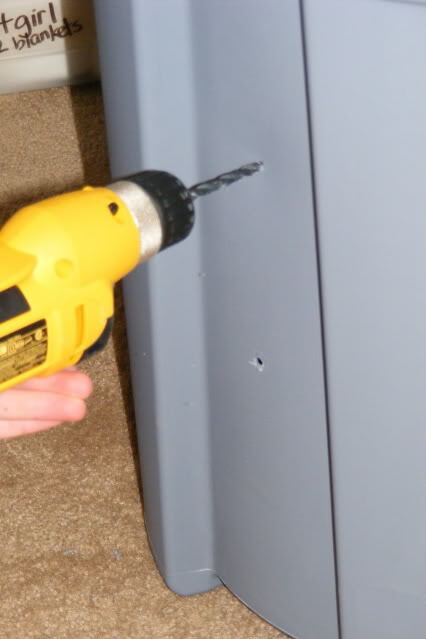 Using the drill, drill holes in the garbage can. We decided to drill 4 or 5 holes on each “side” and bottom of the can. ( I realize circles don’t have sides, but I hope you understand what I mean) After consulting with several readers, I would drill 10 to 15 holes on each side. The more air the better. I recommend using the largest drill bit you have. We ended up doing this two times because our holes were too small initially. You want to have the holes big enough to let air in, but small enough to keep the compost in the can when you roll it. It helps to have one person drilling and another person holding the can steady. Your can should have twice as many holes when you are finished. The more holes the better. 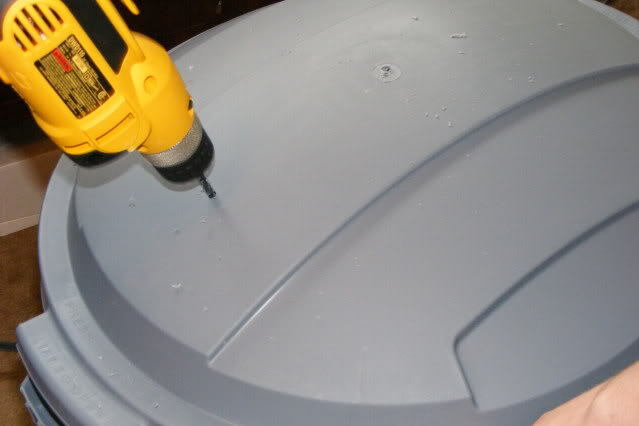 Then drill several holes in the lid. 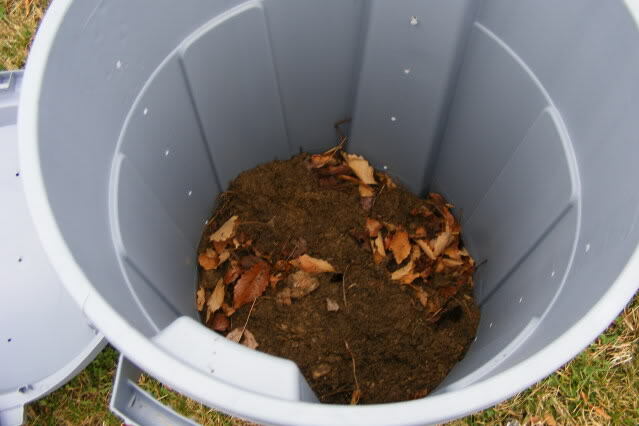 Once you have finished drilling the holes, fill the compost bin about 1/3 full with grass clippings and leaves. Then spray them with a little water so they are damp. You can add your kitchen waste. Here is a list of things you can add to your bin. Keep your lid secured on your bin, we used bungee cords. 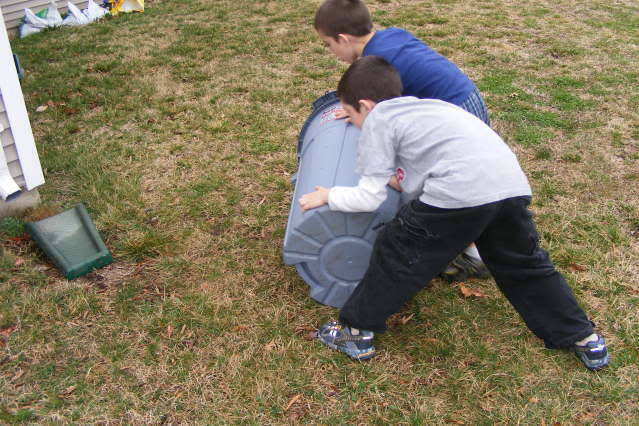 Every few days have your helpful children roll the bin around the yard to mix things up. Store your bin in a sunny spot to help break things down quicker. Total cost of this project: About $15 for the can, the bungee cords were in the garage. Total time spent: Less then 30 minutes including clean-up. LOL! I love your disclaimer! I’m going to make mine following your pattern and we even have some old plastic garbage cans under the deck that just hold some old hoses and junk. Tons on bungee cords in the garage also. So this won’t even cost me anything. You’ll have to report if your smaller holes work as well as the others 2-3 inch mesh-covered holes. *clapping* Good for you, Mom! I was just trying to figure out today how to make a compost pile. This is awesome and would work well in our small yard space! that is pretty funny with your disclaimer. i am going to take yout tweet and see if my 2 year old can make it, hehe. might try this i need a compost bin and cant afford a 300 one! This is GREAT! I’ve been looking for something like this to do with my kids! I can’t wait to do this over spring break! That is really something. 🙂 My compost pile is just two seperate spaces next to my fence. Critters like it there. I should make the one you have and force the kids to do the compost hussle. Bed rest is hard — you are away from the action and after a bit, it frankly hurts. I was on bed rest with my 4th child from 14 weeks until birth at 36 1/2 weeks. Moms in Repose was an organization devoted to moms on bed rest and one of the things they stress is to focus daily on what you can do rather than lament what you can’t. This project has that mindset written all over it. Good job! I’ll bet everyone had fun making it and I’m sure the kiddos will enjoy rolling the can around the yard. Happy composting! That’s AWESOME!!!! Hubs was shocked at how easy and effective it looked…guess I’ll be heading to Wally-world for a can and some cords so that we can get into composting again!! I want to start a compost bin, but per our HOA rules, I can’t keep garbage cans outside (except on trash day). Is it at all possible to compost indoors? Like, if we kept the bin in the garage, for example. That is exactly what we did. It has worked great. We have 2 of them, so that one is finishing off and 1 is for new scraps. You can add worms to it to speed up the process. Don’t forget to add dry – newspaper shredded works great to keep the smell down and to have a healthy balance. My HOA doesn’t allow trash can compost either. But the local city sells compost tumblers 2 times a year for under $40. Last time they were $25 each with a limit of 2 per house hold. Check your local city, they might have a similar program. This is just awesome I was just talking to DH about wanting to do a compost pile in the backyard and he didn’t want “that” stuff just sitting out in the open but this way I might just be able to convince him to do so. I’m definitely going to have to give that a try. We have a worm compost bin inside but we produce tons of produce scraps with 6 kids that I’ve been wanting to add an outdoor bin. I had been wanting something easy but I just couldn’t bring myself to pay $100 for one out of a catalog. We just have a big pile in the backyard. 10 feet of screen makes a roughly 3-ft diameter circle, and we piled up lots of leaves and yard waste inside. Food waste gets added on top, a pitchfork is used to bury it slightly. Worms come from the ground, rain comes from the sky, and barely any work is needed on our part to turn out great compost. Sometimes we turn it with the pitchfork, but rarely. Worked a lot better than the plastic bin I initially started with. I’m emailing this to FishPapa right now! This is exactly what I’ve been wanting. Thanks for showing me how! This is just like my composting bin! 🙂 Although, I bought a trash can with a lid that locks on, so I don’t have to use the bungee cord. Hope you enjoy it! What a great idea! I’ll have to put it on the boy’s to do list!!! Great tip! I’ve been wanting to make one of these for awhile. I did this compost bin a couple weeks ago. The hard part is waiting for something to happen! That was funny about the labor laws. My boys help out quite a bit around here! This is great! I have been wanting to do one and then read something about needing to keep worms in there? It kind of grossed me out so I thought maybe it wasn’t for me. We can definitely do this. This will be our 2nd year gardening and I’m hoping we won’t have quite as much rain as last year! Sorry you’re on bedrest – I’ve been there, done that and it’s quite boring! Looks like you still have plenty to keep you busy, though! 1) I think more holes would be better. Composting requires oxygen, so drill a ton of holes – I drilled maybe 60 or 70 per trash can, and I used a bigger bit (3/8″). 2) I didn’t drill holes in the lid. The main reason I use a lid is to keep rain and animals out. I did drill maybe 15 holes around the top rim – just under the lid. 3) Drill holes in the bottom. Earth-worms will find their way in along with microbes from the soil it’s sitting on. Plus you MUST have a way for this to drain or you’ll end up with slimy gunk. 4) If your primary source of nitrogen is grass, do not add more water. It will turn to slime. I add NO water because my primary source of compost is fruit and vegetable peels/scraps. If you don’t have holes in the bottom of your can, you will literally have 6 inches or more of standing water/slime in the bottom – even if you don’t add ANY water. Trust me on this. I had to dump mine out, spread it out, and let it dry. It was a mess! So be sure to add plenty of straw, dry leaves, or shredded paper, for every batch of grass/vegetables/fruit you add and NO water. Most of the stuff you add is mostly water. I suggest you stop doing this immediately. You have no idea how dangerous human food can be to a dog. Save yourself hundreds on vets bills and feed him dog food only. Sounds great! Can’t wait to get started. How long does this process take until you can use it in your garden? I’ve got the Arizona heat to help me out. Well done. Good luck with your compost. You may want to add more holes if the can starts to smell. More air = aerobic decomposition, less air = anaerobic decomposition which is very stinky. Oh, thanks for the tip! I’ve been wanting to make a composter of some type – I keep seeing ideas for bins with worms, but ew – no thanks. I like this!! Good for you! Every yard should have a compost bin. It’s so nice to see that “black gold” after things have broken down. Very rewarding tackle! I love this idea! 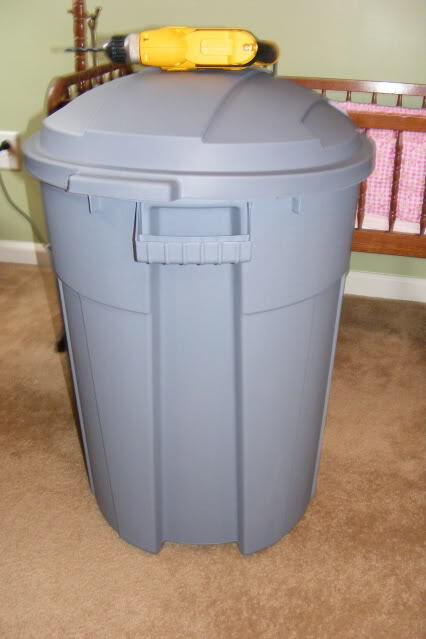 I’ve always wanted a compost bin, but couldn’t decide on a location and how to go about it really. THIS, I could do, and my son would love getting out there and rolling that thing! I had to snicker slightly at the person who commented about not feeding scraps to dogs though. Yeah, I’ve “heard” it’s not good for them, but my dog has eaten them all her life. She is 14 years old and going strong – never been sick or needed trips to the vet other than rabies vaccines. She’s as healthy as a horse! So, it just made me laugh a little! This is AWESOME! We just followed your instructions this afternoon! Woohoo! This is great. I have been wanting more information on composting. Thanks for the easy project. I think I’ll start this weekend while starting my garden. Thanks for easy composting instruction. I plan to start this weekend while starting my garden. I want earthworms in my compost bin but read they like temps no hotter than 77 degrees. Unfortunately I live in HOT Florida. I was wondering if…..
anyone has had (in a hot climate) success raising earthworms in their compost bin? I made the exact compost bin but put holes in the bottom, raised it by sitting it on four pots, and put a pan under to collect compost ‘tea’. In the bin I put equal amounts of leaves, torn newsprint, grass clippings, table scraps, and a bag of store bought cow manure which contained several earthworms. I am really hoping the worms will multiply but fear they will die in the heat. Only morning sun hits the bin. I also keep the lid half open during the day and close only at night to protect from animals. Thank you so much for the info and the good laugh. I am going to go out right now and make it! Sigh. If I only had either an available trashcan with a lid, or a spare $15-$20 to purchase one. My 14yo wants to start composting and it’s not going very well! Thanks for the important amendment to the Happy Housewife’s great idea. I hope more people read your post. there are several ways to compost your kitchen scraps! i have 2 different systems and looking into another one currently. 1) i have an expensive $190.00 compost bin fill the top and remove finished from the bottom. 2) vermicompost, with this system you can keep it in your appartment, basement, garadge, warm months outside. red wiggler worms eat food scraps and can be kept in small plastic bins or totes, my favorite web site about this is http://www.redwormcomposting.com/getting-started/ and 3) now i have found another interesting way to compost my kitchen scraps with black solider flys. they do not bother you at your picnic they do not annoy you they do not carry disease i am looking forward to starting my first biopod. i came across this web site threw the red wiggler worm site i mentioned above. http://www.thebiopod.com/ i am finding out that i can start my food scraps in the biopod with the black solider flys then when they are done eating i can move the scraps to the red wiggler worm bins then when they are done eating i can move the mostly decomposed scraps to my big outside compost bin for it to finnish off. the black solider flys like the fresh food scraps. the red wiggler worms like to eat the microbes that grow on decomposing food scraps. hope you all find the system that works best for you! good luck to you all! enjoy! I LOVE it!! We are on year 2 of Square Foot Gardening and I cannot decide whether we will tackle our on compost this year or next! You make it look easy enough to do this year!!! We have the frames built for this years garden. Hoping to have it all in by this Sunday! Thank you for sharing your inspiration. Best wishes for safe delivery with a healthy baby and mommy!! I love the kids rolling it around too! 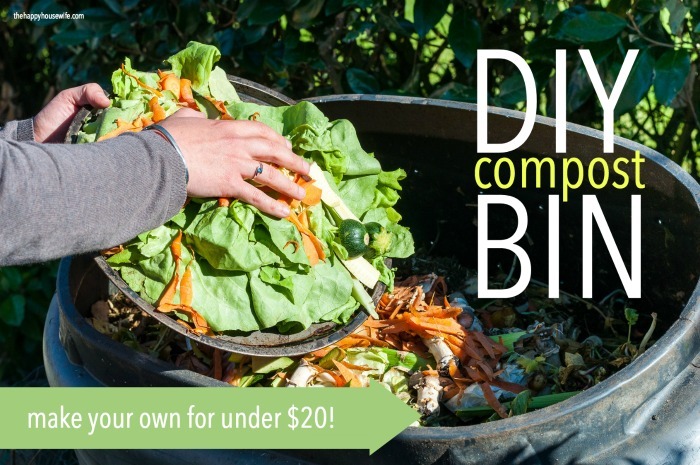 Great DIY compost! I built one on Auto Cad, planing to using a 55 Gallon barrel. You can check it out on Homesteadearth.com At first I though I was one of the only guys on here, but then I saw a few other guy names! I agree with Bob about using more holes. I think for my compost bin i will try to add a few large holes possible with screens, Im still tossing the idea around and am not sure. Thanks for the Great Post, Lots of good info and great family project! Thanks for posting this! We tried a different DIY composter last year, and it didn’t work very well for mixing. This one that can be rolled (and sit up descretely in a corner of the back yard) seems perfect! We’ll definitely be making one soon. OH! I’ve been wanting to start a compost pile/bin/something, but everything is super expensive or seems overwhelmingly complicated. This . . . I can do. Totally. And the kids rolling it around the yard, a plus! What utter bull about dogs and human food. Dogs evolved to eat scrap human food as scavengers. The “dog food is the only safe food for dogs” myth was brought about by pet food manufacturers. My dad built a similar model using a trash can except that he cut off the bottom and dug it into the ground. The concept was that he wanted a compost pile but had to somehow prevent animals from getting to the food scraps. The advantage to his model is that it allows any extra wetness to easily escape . Disadvantage? He can’t turn it as easily as your model! 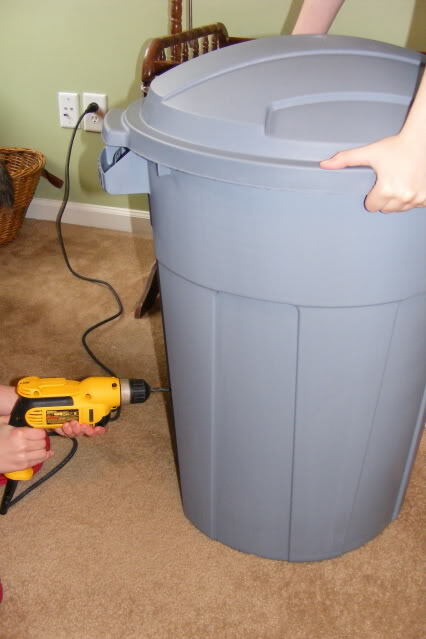 I saw a 32-gallon plastic container at Home Depot for around $15, and I thought it would be the cheapest and easiest way for me to make a composter; however, I didn’t go ahead with the project because I was concerned that the plastic might not hold up to the heat generated by the composting process. Well, now, thanks to you, I’m going to risk it. This is a great example of keeping it simple! I really like this plan for ease of use and cost, but I was wondering if you have any concerns not using a food grade container? After researching, it seems certain plastics can breakdown dangerous chemicals which would be absorbed by your garden vegetables through the compost. Just wondering your thoughts on this? Thanks for posting this. 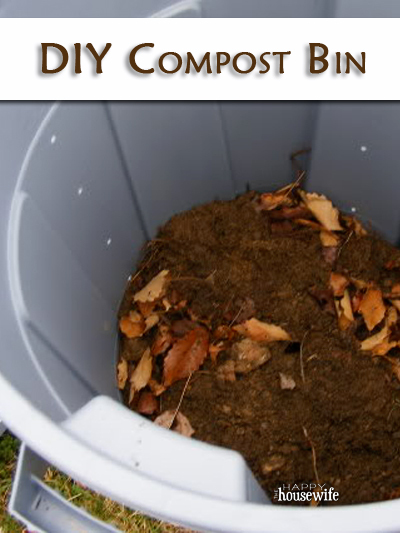 We have been looking for an inexpensive way to make a compost bin. We probably have a spare trash can we can use, too! So glad you reposted this! I din’t realize how easy it was to make one of these! Guess who is getting one for their birthday? @Tamara, If you are worried about BPA and other chemicals leaching into your veges, you could always use a steel bin, probably a fair bit dearer though. As a Labor and Delivery RN, I absolutely love your disclaimer!! Great ideas for the compost bin too! totally doing this – thanks- been looking for an inexpensive way to do it and this looks good! I’ve heard that adding some worms to the mix would help speed the composting process. Could worms be added to this rig you’ve set up here, or should I be looking for another type of bin better suited to housing worms? TIA!! I made my own a few years ago using a black trash can ( to help absorb heat) . This one had the flip-up handles to hold on the lid, which I bungeed together when I rolled it around the yard. Works great! I found that torn up cardboard & shredded paper help substitute for the “brown” compost when you run out of dried leaves & grass. Thanks for the tutorial!!! How well has this bin worked? 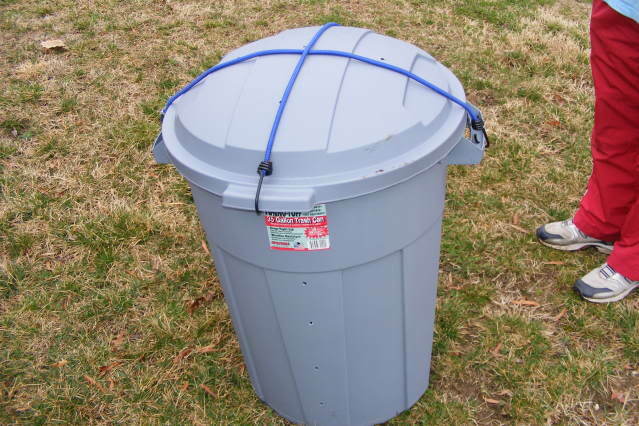 I’m trying to find a good (and super cheap) way to make a hassle free compost bin. I’ve been using this method for years and years. I have 4 cans is use now! I would strongly advise drilling holes in the bottom can the can also, otherwise the bottom may get too wet. Yes, I would drill holes in the bottom as well. This is much easier than the method I tried with a storage container. It was the same principle, but we couldn’t roll it around like this one. I will be adding at least one of these to our little homestead this year. Thank you for sharing the link with the Mom Tested Family Approved Ultimate Garden link up! Went to Walmart and bought a $10 black garbage can with snap-on lid, drilled holes in it and now I can’t wait to start making compost! Such a great idea! Thank you! I think the holes are necessary for drainage and air circulation. How long did it take for you to get usable soil? This is almost exactly what I did two weeks ago, and two weeks later, the leafy bits were broken down, the twiggy stuff and veiny stuff, not so much. By Ontario standards, it was pretty cool for those weeks. I rolled it when I remembered, maybe too muchh water, but never went anaerobic. My motivation was ‘too many trips to the dump’, the volume drops about 80-90% in the two weeks. Didnt nget to 140F, but I never expected it too… and I only use garden waste and coffee grounds, no food scraps or paper— been there done that, cleaned up after racoons and nearly stepped on skunks. So interesting idea! I have a little veggie garden and I think that this composting bin is more than amazing idea! I will definitely make one! Thank you for the idea! 3. Does it stink when you open the bin lid each time and the stench can travel to your house. 4. The hot weather rot the compost sooner than one can use them or how often is the compost being used? You’re funny. Thanks for the tutorial. We just got a house and should be ready for serious planting next year. Hi just a quick note to say thanks for the tutorial, i grow fruit and veg in Containers or Raised Beds or Waist High Planters. You mentioned that this only cost you $15? i think it cost you more than that, don’t forget the extra sweets for the kids (wages), for rolling it around the garden ha ha ha. Try to build a stand for the bin, that way you can roll it easier and not cost you more for the kids wages.